The recent warning by the National Disaster Management Authority (NDMA), that Pakistan may be heading for an early monsoon — as early as June 15 — leading to torrential rains and hence floods, has sent the alarm bells ringing. Or at least it should. The authority has declared 29 districts vulnerable and claims that “some 29 million people would be facing flood risk in the next monsoon”. The recent MET department warning about abnormal rainfall in the upcoming monsoon has given rise to several questions. For example, how prepared is the country to face such a calamity? Have the recommendations made by the various flood commissions been followed in spirit? Have the affected people of the previous floods been accommodated? Is there a proper mechanism in place to manage excess water? And, have dams and spurs been repaired to serve the purpose? The floods of 2010 hit the fertile lands of Layyah District in southern Punjab hard, displacing hundreds of thousands of people from their homes. The death toll was particularly high here as affectees were reluctant to move from their abodes despite repeated warnings issued by the government authorities. This is where River Indus expands in width, around three kilometers, and flows majestically. In 2010, it swelled up to 18 kilometers at some places. The provincial disaster management authorities (PDMAs) were established in the year 2006 when, under the National Disaster Management Ordinance (NDMO 2006), a legal and institutional framework for disaster management at the federal, provincial and district levels was chalked out. However, the PDMAs became more pronounced — as well as independent — after the promulgation of the 18th Amendment. And, in 2010, the NDMO was made into an Act and the District Disaster Management Units (DDMUs) were set up in order to further facilitate the workings of the PDMAs. These bodies are responsible for forming contingency plans, with the involvement of the local populations and civil society organisations, to look after the dykes at rivers and canals meant to avert floods, to disseminate early warnings to local communities and to conduct rescue operations in the event of a disaster and rehabilitation efforts later on. Pakistan is a disaster prone country and has seen flash floods as many as 67 times since its inception in 1947. The UN declared year 2010’s flood as the greatest humanitarian crisis in the history of the country, and last year’s deluge reportedly affected a population of 5.3 million and inundated 1.7 million acres of arable land. Every time, the devastation was beyond the capacity of the government to handle, placing a great deal of onus on the local and international non-government organisations (INGOs) which responded quite effectively and won the trust of the local population and the world alike. Come to think of it, 80 per cent of the international aid in 2011’s flood was possible though them. In the event of another flood this year, the local and international NGOs will again be looked to for help, as the government tainted with huge corruption scandals may not be able to spare enough funds. Pakistan’s flood warning system is quite complex and involves a host of departments like Pakistan Metrological Department (PMD), Wapda, SUPARCO, Federal Flood Commission, Indus Water Commission, the national and provincial disaster management authorities, provincial irrigation departments and district officials. This system has not proved to be efficient in gathering and disseminating flood warnings in time. This issuance of a timely warning is ironically a measure of the efficiency of an authority which is not exactly known for it. But the truth is that the country is not ready for such an eventuality a third consecutive year. Normally, the floods season is late July and August but an early monsoon leading to early floods may mean that the preparations that are supposed to be in place some time later have to be put in order rather early on. Floods of the scale that we saw in the last two years are a natural disaster. But, in both years, the safeguards that we were supposed to have were found to be wanting. Of course, there are lessons to be learnt from the past experience which, in our case, is not too long ago. In fact, we are still struggling with the rehabilitation process after the last year’s floods in Sindh. Of the short term measures that needed to be taken (and which were ignored over the long term) were the Irrigation Department’s job of strengthening and repair of dykes and spurs etc. These were said to have maximized the losses. In the event of the disaster, in the last two years, the usual complaint was the refusal of the people to evacuate their homes. Now is the time to find out if a mechanism has been put in place to give sound alternatives to the vulnerable communities should a similar disaster strike again. There are related issues like deforestation that trigger climate change of this kind and we must be alive to it. The institutional mechanism in place post devolution now boasts of PDMAs and DDMAs and their role and efficiency need a serious appraisal in view of the recent warning. Lastly, the role of international NGOs in managing floods must be taken into account simply because it was substantial in the previous years. All these issues are part of today’s Special Report. As rain water takes little time to reach the plains from the hills and from the plains to the sea, the authorities dealing with floods practically do not have enough time to plan. The rivers in Punjab, he further writes, have become shallow due to the lengthening of their channels through a meandering course and continuous silting. Besides, human encroachment of the flood plains has also increased the flood hazards as excess water is bound to spill over to inhabited lands. This holds true also for the other low riparian province Sindh where the breaking of dykes increased the scale of the disaster. The situation calls for devising a comprehensive water management plan that includes strengthening the dykes and controlling the flow of water. A judicial commission, formed by the Sindh government in 2010 to look into the matter, also recommended drastic measures to improve the situation and flood preparedness level. The situation at the moment is that the Sindh government is working on water schemes that cost Rs5 billion. Initially, it had submitted 76 schemes worth Rs16 billion to the federal flood commission but only Rs5 billion were earmarked for the urgently required schemes. TNS talked to different people to find out about the reasons behind the inefficacy of water management plans devised over the years and ways to make them effective in the future. According to Zulfiqar Halepoto, a Sindh based doctoral research fellow on river diplomacy and trans-boundary water cooperation between Pakistan and India, there are several structures, regulatory systems and irrigation networks to control the flow of river water. For example, these options are available along the Indus River which enters Sindh at Kashmore and falls into the Arabian Sea. It happened in the 2010 floods when more than 25 towns of Sindh were inundated due to breaches in several dykes, says Halepoto. Besides, whenever there is fear of a lapse of surplus budget or funding with the irrigation department, the irrigation officers intentionally give cuts to dykes to justify the allocation of maintenance and expenditure budgets. He suggests rain and flood waters should be regulated through small structures at district levels. Ahmed Kamal, Member, Disaster Risk Reduction (DRR), and spokesman National Disaster Management Authority (NDMA) tells TNS the authority has sent instructions to all provincial chief secretaries and lined up related technical and provincial departments to ensure preparedness regarding the warnings issued by the MET. Kamal says the press release issued by the MET department is not a sign of an alarming situation; in fact, it’s a routine dispatch, explaining the existing situation in different districts of the country. The monsoon forecast which the department will issue around the second fortnight of June will give a clearer picture. On the issue of the strengthening of dykes and spurs in the provinces, Kamal says it is the duty of the provincial irrigation departments to inspect them with the help of relevant army corps. If they find that the condition of a dyke is critical at some point, they must have it repaired with the help of the operation and maintenance fund from the irrigation departments. On the inspection and monitoring of the strengthening process of the dykes, Kamal says the army corps and the provincial irrigation department have the capacity for that, but to make the system more effective, the Federal Flood Commission (FFC) and the PDMAs have also been asked to monitor the processes. But last year, in 2011, the floods spared Layyah. Most of the damage recorded was in Sindh and Balochistan. And this year again the flood warning issued by the Met department has placed the area, including Layyah, in high risk zone. Two years down the road, Layyah’s locals, rescuers, relief providers and state functionaries seem to have learnt something from the disaster. Fortunately enough for the people, their representatives are organised in the form of bodies like Sindh Wasaib Forum and Chenab Forum and are coordinating with other stakeholders to devise flood preparedness plans. “These are indigenous people. There are around 200 small organisations including community based organisations (CBOs), village bodies, muhalla bodies that constitute these forums,” says Javed Iqbal, Manager, Humanatarian at Doaba Foundation, a relief organisation which has presence in Multan, Muzaffargarh, Layyah and Jhang. The experience of 2010 has created awareness among the people and they are demanding the district management to set up a flood control room in the city which should work 24 hours a day. They are also supervising compaction processes at dykes and identifying places where they appear to be weak. Two major problems faced during the evacuation process back in 2010 were: shortage of boats and people’s reluctance to leave their homes and to abandon their livestock. These aspects are being taken care of, says Chishti, adding private boats like those available with Doaba will also form part of the fleet and each boat will have a rescue 1122 official present on it in uniform along with a trained member of the community. Vaccination of animals will be done in time, there will be a place to keep them and fodder will be provided by the government authorities. Earlier, lack of these facilities had forced flood affectees to sell off their cattle and poultry at throwaway prices, mostly to swindlers. Javed Iqbal however feels some matters are still not clear. For example, how much funds are lying in P-4 account of the district government. It is the amount which can be accessed and used during emergencies and financial settlements can be done later on. Besides, he adds accurate consolidated data on the exact number of houses, animals and agricultural lands at risk is neither available with the government nor NGOs. He says they are also familiarising the state representatives, rescuers and potential providers about the local customs and tradition. “For instance, here men prefer to keep their women in places sinking fast into flood waters than expose them to strangers’ in relief camps where their privacy is compromised. They say, ‘We can’t go from a river flood to a flood of disgrace’, is a common saying,” he adds. This, Iqbal says, was a major reason people did not move out of their abodes. So he suggests camps should be designed in such a manner that privacy is not compromised. In order to serve their stated purpose, the abovementioned bodies need trained staff at least at the district levels, besides heavy machinery and funding. But so far, the PDMAs remain understaffed with bare minimum funds at their disposal. The government of Balochistan was the first to allocate Rs2 billion to the provincial disaster fund in its 2010-11 budget and another Rs3 billion the next year. Where the entire budget for disaster fund in 2010-11 lapsed, the current financial year saw only Rs16 million going to the PDMA which the latter has used up in paying salaries to its staff. The officials at PDMA Balochistan believe the rest of the budget for the year will also lapse as the new budget for the province is presented in a week or so. The situation, sadly, is almost the same in other provinces. 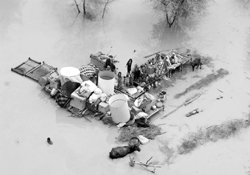 Sindh was the most affected by a flash flood in 2010 and the following year. The role of the PDMA came under fire when the organisation failed to gauge the magnitude of the disaster and, actually, initially refused to take the help of donor agencies, saying it had sufficient means to tackle the situation of its own. Their claims were proved wrong as the province suffered colossal destruction and loss of life. Soomro who claims to have recently visited 24 disaster-prone districts situated on both sides of the Indus, starting from Mianwali to Thatta, believes if the region receives a little above normal rains, the result would be more devastating than in 2010-11. A deputy commissioner posted in Sindh who is also the head of the DDMA in his district, tells TNS on condition of anonymity that so far no contingency plan has been evolved for the district. “We’ve not had a single meeting of the DDMA over the past one year. According to an estimate, from 2005 till 2011, the natural disasters that struck Pakistan have cost the country over $18 billion. However, the World Bank and the Asian Development Bank say an initial investment of just $27 million by the government could repair damages from future disasters. “Pakistan has allocated more than this sum to pay for the National Assembly expenses in the last two years alone,” says Dr Arif Azad who co-authored the detailed report ‘Ready or Not: Pakistan’s resilience to disaster one year on, from floods’ for Oxfam in 2011. This initial investment, followed by a sustained allocation of resources, could include reorganising the existing parallel disaster management bodies, providing them assistance and hardware support in the 30 most vulnerable districts and longer-term flood risk mapping. Experts are of the view that many constitutional and legal issues have not been taken care of. The National Disaster Management Act 2010 makes a renewed legislative commitment that the whole spectrum of disaster would be brought before the PDMAs and the DDMAs with the old relief departments like the provincial relief cells and emergency relief cells at the federal level absorbed into it. But this has not been done and, in almost all provinces, parallel relief bodies still exist. Tahir claims that the PDMAs are in a phase of transition all across the country. “In Balochistan, we have a provincial disaster fund in place, though the budget allocated for it in the last two years has not been shifted to us. But we’ve been working on setting up a different bank account of the PDMA and, hopefully, from next year onwards our budget shall be transferred to that account. TNS contacted some NGOs to find out about their preparedness and learnt that they haven’t any specific contingency plans chalked out, but several of them are working in Pakistan on sustainable projects and others are waiting to get funds in order to resume long-term projects. There are bad signals as well. The International Committee of Red Cross (ICRC), an INGO working in 80 countries with its 12,000-plus staff, recently suspended its activities across Pakistan following the killing of one of its staffers, Khalil Dale, in Balochistan on April 29 this year. Khalil was abducted in January 2012 from outside the ICRC’s Quetta office. The efforts of the local NGOs have won them accolades as well as public trust. Edhi Foundation is one such organisation. Talking to TNS, Abdul Sattar Edhi, says his organisation is fully equipped and ready to respond in the event of a calamity in any part of the country. The relief and rehabilitation efforts of the United Nations High Commissioner for Refugees (UNHCR), Pakistan, were commendable in the floods of 2010 and 2011. 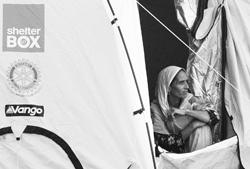 Qaisar Khan Afridi, Public Information Associate, UNHCR, says the UN refugee agency assisted hundreds and thousands of people by providing them with tents and non-food items like blankets, kitchen sets, buckets, quilts, jerry cans and plastic sheets. He further says the UNHCR’s flood response interventions target the most vulnerable among the victims, including people with disabilities, women without a male guardian, and families unable to rebuild their own houses. “The agency has completed 3,838 one-room shelters in Punjab, 6,000 in Sindh, 8,550 in Balochistan and 14,000 in Khyber Pakhtunkhwa. Keeping in view Pakistan’s disaster prone condition, many INGOs are making efforts to enhance their capacity and improve their infrastructure so that they can work on long term basis. Their efforts will definitely be supportive to Pakistan in any such calamity. A secure environment for the staff of the INGOs is of vital importance and the government’s failure on this front would not only hamper the ongoing rehabilitation efforts but also put any future humanitarian assistance at stake. Currently, the meteorology department can only predict weather patterns of up to four days in advance, weather radar systems are limited and they do not cover our eastern rivers, catchment areas in most parts of Khyber-Pakhtunkhwa, Gilgit Baltistan and Kashmir and important coastal areas of Balochistan which are vulnerable to cyclones. Saleem Sheikh, a leading Pakistani journalist working on climate change issues and disasters, believes that Pakistan’s major issue is adoption of modern technology. “In Pakistan, we have weather monitoring stations at five glaciers only while we have more than 4000 glaciers in the country. We have only three radar observation stations at Jhelum and its tributaries, while only six such stations to monitor flooding at Indus River. So, the current flood management system only meets requirements for the Indus River flood plains in Punjab and Sindh. No system exists in KP or Balochistan to forecast or monitor the flash floods that have become more frequent in these provinces and in South Punjab. A well coordinated but less complex early warning system for floods that integrates flood forecasting and monitoring and dissemination of information to vulnerable communities is essential. “We have a problem with the service delivery record of the NDMA, the PDMAs and local authorities at district level in this regard,” he says. A study shows that the 2010 floods in Pakistan could have been predicted if the data which originated from the European Centre for Medium-Range Weather Forecasting (ECMWF) had been processed and fed into a hydrological model, which takes terrain into account. “People don’t understand the power of modern environmental prediction,” said Peter Webster, a professor of earth and atmospheric science at the Georgia Institute of Technology in Atlanta and lead author of the study, in July 2011. Peter also spoke of a prospective forecasting system in Pakistan that would cost a few million dollars to set up but as little as $100,000 a year, once operational.